Getting a slow start this morning, but I see bright sunshine and two of our four family members are off to school/work, so that's a good start! Wow, what a weekend. After a week with both of our sons home sick, I was feeling a bit stir-crazy and desperate for some quiet solitude, so I just left on Friday! Some friends loaned me their beach condo for a quiet getaway, and I drove down there to spend 24 hours on my own, taking care of no one but myself. It was....weird, but good. 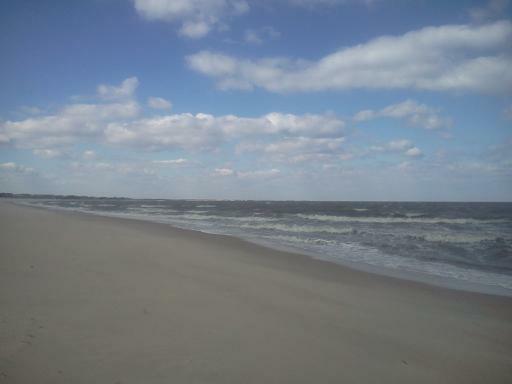 It took me a while to actually relax, but the downtime was a welcome respite. What a strange world where doing dishes takes only two minutes (wash 1 plate, wash 1 fork), and I can do anything I want! I got 3 hours of audio book time on the way there and back. I didn't do as much reading as I'd planned because I stopped at the library on my way and picked up the entire 7-hour mini-series of Ken Follett's The Pillars of the Earth, which I read and loved last summer. I didn't watch the entire series (still have 2 episodes to go), but it was fun to just lie on the couch and escape into the story! Of course, I returned home to all the same stuff - messy house, sick kids, long to-do list - and spent the rest of the weekend working on some urgent things with looming deadlines, but the time away definitely helped. I finished middle-grade novel The Whisper by Emma Clayton, sequel to The Roar which my son and I both loved. I think the first book was a bit better, but this novel provided a satisfying ending. Yesterday, I finally started to read Skeletons at the Feast, a novel set in 1945 Europe by Chris Bohjalian, my neighborhood book group's choice for this month. We meet on Wednesday, so I am afraid there is virtually no chance I can finish this 360-page novel before our discussion. Since Bohjalian is known for his surprise endings, this could be trouble - I may have to lock myself in the bathroom for part of our discussion. Damn that 7-hour mini-series! I am listening to an audio book, Falling Together by Marisa De los Santos. I enjoyed reading her earlier novel, Love Walked In, and am enjoying this one so far, too. It was fun to lose myself in the story during my drive this weekend, instead of my usual routine of listening in 10-minutes spurts. My husband, Ken, is still reading an e-book, Big Lake by Nick Russell, on his Kindle Fire, and Another Thing to Fall by Laura Lippman, a hardcover novel. Craig, 14, is reading The Secret of Pirates Hill, a classic Hardy Boys book and is enjoying the familiar, fast-paced mystery. I posted two new reviews last week: Breathless by Dean Koontz, a unique and mystical story very different from his horror novels, and The Girls of No Return by Erin Saldin, a teen/YA novel about a wilderness reform school that I enjoyed. Years ago, back when I read mostly suspense and thrillers, I read lots and lots of Dean Koontz books; most of them dealt with scary, horrific themes, populated by psychotic or paranormal characters who wreaked havoc on the world around them. My husband recently read a newer Koontz novel, Breathless, and told me, “You have to read this book. I know you’ll love it.” He was right! 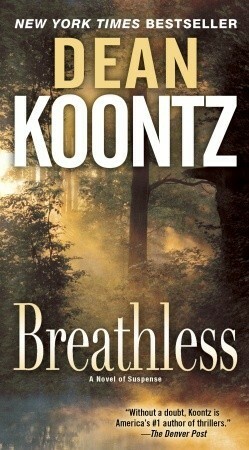 Breathless is wholly unique, different from other Koontz novels I’ve read. It is mystical, magical, and thought provoking. When I asked my husband what the novel was about, he said, “Um…I really can’t tell you much or it will give it away.” He was right about that, and I wouldn’t want to ruin the surprises in this book for anyone else, so I will try to tell you just a little about it. There are many different characters in Breathless, and the book begins with each chapter following the life of a different character. You get the sense immediately that their stories will somehow come together at some point, but you can’t see how for a long time. Grady Adams walks through a park in the Colorado mountains with his big, lovable dog, Merlin, and comes upon an amazing sight. Cammy Rivers, a veterinarian, is called out to investigate some very unusual animal behaviors. Meanwhile, Henry Rouvroy drives to visit his long-estranged twin brother. In Las Vegas, a scientist who specializes in chaos theory goes from one casino to the next, raking in big winnings, with some unusual ideas on what to do with them. Out in California, a homeless man who has spent much of his life drunk and stoned suddenly sets out on a determined quest. The reader is introduced to these characters – and more – one at a time, and their stories gradually develop. True to form, Koontz does include a couple of psychopaths, though it’s hard to see how their stories will intertwine with the rest. Gradually, bit by bit, Koontz pulls you in, making you care about the characters and introducing some very mystical events that have a dramatic impact on them. There is ample suspense, which you’d expect from a Koontz novel, but also philosophical musings, which I didn’t expect. I found myself marking pages and writing down quotes, on topics as diverse as hope, despair, and the process of scientific discovery. At the very end, when things finally do all come together, I felt satisfied and enlightened, filled with wonder and thoughts of what might be possible. P.S. Do NOT read the Booklist review of Breathless, posted on amazon.com - the reviewer not only gives away all of the surprises in the book, taking away that wonderful feeling of discovery, but also totally misses the point of the novel. In fact, don't read any other reviews - I noticed that almost all of them give away too much! This is a novel that is best discovered bit by bit, as intended. Whew, what an exhausting weekend after a busy week! I drove Jamie and I to see our Lyme doctor in New Jersey (about 90 minutes away) on Friday. Our younger son was in an all-day Academic Quiz Bowl Saturday (he did well and had a great time! ), and we had a few friends over last night for a little Mardi Gras celebration. We usually have a bigger party (we used to live in New Orleans), but with Jamie and I so sick lately, we decided to stick to a smaller, simpler gathering - just a few close friends who also used to live in New Orleans - you know, the kind of friends you don't have to clean the house for! This weekend, I finished Breathless by Dean Koontz - my husband was right - I loved it! It is mystical and surprising and thought-provoking...not your typical Koontz novel. As soon as I finished, I immediately picked up a middle-grade novel I've been wanting to read, The Whisper by Emma Clayton, sequel to The Roar which my son and I both loved. I finished listening to The Power of Six by Pittacus Lore, the teen sequel to I Am Number Four. I wasn't thrilled with the audio, but it's a good story. I started a new audio, Falling Together by Marisa De los Santos. I enjoyed reading her earlier novel, Love Walked In, and am enjoying this one so far, too. My husband, Ken, is still reading an e-book, Big Lake by Nick Russell, on his Kindle Fire, though I think he is spending much more time playing Solitaire and surfing the web than reading! Ken is also still in the middle of Another Thing to Fall by Laura Lippman, a hardcover novel. Jamie, 17, is still reading Timeline by Michael Crichton, one of my favorites of Crichton's many exciting novels. He's enjoying it very much. Jamie also finished his World Lit assignment, To Live by Yu Hua, a Chinese novel. He said it wasn't too bad, for school reading, though it was sad. Craig, 14, started Found, Book 1 of The Missing by Margaret Haddix Peterson, and realized his 5th grade teacher read it aloud to the class (which means he's already taken the AR test), so he had to switch to another book. He was in the mood for a some comfort reading, a classic Hardy Boys book, so I brought a stack back from the library for him to choose from. He settled on The Secret of Pirates Hill. Last week, I posted a review of The Mambo Kings Play Songs of Love by Oscar Hijuelos plus two lists for Valentine's Day: Top Ten Books That Broke My Heart and Top Ten Kids/Teen Books That Broke My Heart. I also posted my own little homage to A Wrinkle In Time's 50th Anniversary. One of my book groups met this week to discuss The Mambo Kings Play Songs of Love by Oscar Hijuelos, winner of the 1990 Pulitzer Prize for Fiction. Most of us agreed that, although a bit long and rambling at times, it is a novel worth reading. Mambo Kings tells the story of two brothers, Cesar and Nestor, who grew up in Cuba and immigrated to the United States in 1949. They found jobs in a meat-packing plant in New York City by day and formed a band, The Mambo Kings, for which they played, sang, and danced by night. The highlight of their brief celebrity was an appearance on the I Love Lucy show, as Ricky’s Cuban cousins visiting New York and playing a special show at the Tropicana, after Desi Arnaz heard the brothers’ band one night and invited them on the show. The whole book, except for a brief prologue and epilogue, is narrated by Cesar, the older brother, as he sits in a decrepit hotel room in 1980, drinking whiskey and waiting to die, thinking back over his 62 years of life. That’s why the novel sometimes feels like it is rambling and long-winded; it is the remembrances of a tired old man. The story jumps back and forth through time, sometimes going all the way back to his childhood with an abusive father in Cuba, sometimes recalling their glory days as the Mambo Kings, sometimes considering recent years with family and friends, and occasionally even settling briefly in the present. It’s an interesting story, and most of our book group agreed that one of the best parts of it was being transported to that particular time and place, within the musical Cuban immigrant community of New York in the 1950’s, when men wore hats and suits, women dressed up to go to the store, and everyone lived for dancing to live music on the weekends. Hijuelos’ prose does transport the reader; his novel is filled with lush sensory details: the vibrant flowers of Cuba, the noise-filled dance halls of New York, the sights, sounds, smells, and feelings of living in that time and place. Cesar himself is a stereotypical Latin American male: macho, self-confident and swaggering, and an enormous womanizer (who loves to recall his sexual conquests in great detail!). His younger brother was quieter, more introspective, and less confident, yearning for true love. The prologue and epilogue are narrated by Nestor’s son, Eugenio, so there is a brief glimpse of his perspective, too, as the next generation. None of the six women discussing the book in my book group this week loved this novel, though most of us (myself included) said we were glad to have read it. One woman really hated Cesar’s womanizing, so she disliked the book for that reason. It is an interesting look into the lives of Cuban immigrants (and a glimpse into pre-Castro Cuba). Many of us were also fascinated with the world of the mambo bands, something none of us knew anything about before reading the book. Several of us went to YouTube and Wikipedia while reading the book to read more about mambo and watch videos of the various real-life musicians mentioned in the novel. I enjoyed this video clip of the Mambo Kings’ biggest hit, Beautiful Maria of My Soul (from the movie adaptation of the novel). Happy Valentine's Day! 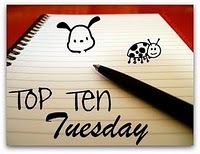 It's Tuesday and that means it's Top Ten day over at The Broke and the Bookish. Today's very appropriate topic is Top Ten Books That Broke My Heart. Ah, I love a book that can make me cry. I think that is a sign of a good book - one that can make you feel something, a book where you come to care about the characters so much that it breaks your heart when something bad happens to them. So, not surprisingly, this list has a lot in common with my list of favorite novels ever. You can also check out my list of Top Ten Kids/Teen/YA Books That Broke My Heart. The Time Traveler’s Wife by Audrey Niffenegger, one of the greatest love stories ever written and sure to be heartbreaking when one of the lovers keeps time traveling away from the other. Life on the Refrigerator Door by Alice Kuipers - amazing how so few words (notes written between a mother and her teen daughter) can wring out so much emotion. Firefly Lane by Kristin Hannah, mirroring real life with its ups and downs, this novel made me cry 3 - count 'em 3! - times. Still Alice by Lisa Genova - how could a novel about early-onset Alzheimer's disease be anything but heartbreaking? The Kite Runner by Khaled Hosseini - a heartbreaking incident in childhood defines a man's life forever. A Thousand Splendid Suns by Khaled Hosseini - the story and circumstances of each of the women in this novel is heartbreaking. Heretic’s Daughter by Kathleen Kent - the story of a woman falsely accused of witchcraft in Salem and the effects on her daughter haunted me for months after I read it. The Story of Beautiful Girl by Rachel Simon - a decades-long love story between a mentally handicapped woman and a deaf man that is both heartbreaking and uplifting. My Sister’s Keeper by Jodi Picoult - a young girl whose purpose in life is to save her sister's life inspires plenty of emotion. The Crowning Glory of Calla Lily Ponder by Rebecca Wells - this audio book took me through every emotion imaginable - I laughed out loud, sang, screamed, and yes, cried my eyes out. One Mississippi by Mark Childress - you have to admire a novel that can both make you laugh out loud and cry out in grief. So, that's my list. What books have broken your heart? Oh, shoot....is it Monday? 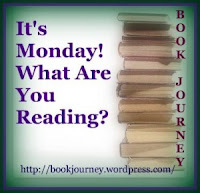 I completely forgot about What Are You Reading Monday this morning! I jumped right into working on all the stuff I meant to do last week. My oldest son and I were both in bad shape all week (again) due to a continued flare-up of our chronic illness. I am doing a bit better this week, though he is still down and out. This past month has been rough around here. I finally finished The Mambo Kings Play Songs of Love by Oscar Hijuelos, a Pulitzer Prize winning novel about two Cuban brothers who move to NYC in the early 1950's and start an orchestra. It was good though a bit long, and I am looking forward to discussing it with my book group this week. Next, I read an excellent teen novel, The Girls of No Return by Erin Saldin, about an emotionally scarred teen girl's experiences at a wilderness school, interacting with other damaged girls, trying to face their Things. It was well-written and compelling. Now, I am reading Breathless by Dean Koontz, a supernatural novel my husband has been telling me I would love - so far, so good! While traveling for business last week, my husband, Ken, switched to his Kindle and read an e-book, Big Lake by Nick Russell, a mystery. When he returned, Ken switched back to a hardcover suspense novel he started last week, Another Thing to Fall by Laura Lippman. Jamie, 17, finished The Whisper by Emma Clayton, sequel to The Roar which he and I both loved. I wanted to read it next, but it was in his room while he was sleeping when it was time for me to choose a new book! Definitely going to read that one next. Jamie also read The Unwanteds, Lisa McMann's new middle-grade novel, and enjoyed it very much - another one in my towering TBR stack! Jamie ran out of teen novels he was interested in (a rare occasion in our house), so last night he started Timeline by Michael Crichton, one of my favorites of Crichton's many exciting novels. Jamie is also reading a new book for his World Lit class, To Live by Yu Hua, a Chinese novel. Craig, 14, finished The Hunger Games and said, "It was SO good!" This is very high praise from someone who usually prefers active pursuits to reading. Craig had trouble choosing his next book this weekend but finally settled on Found, Book 1 of The Missing by Margaret Haddix Peterson. Jamie and I both enjoyed this series, so I hope Craig will like it also. So that's it - lots of reading for all of us this past week. I wasn't well enough to write any reviews, but I did manage a couple of top ten lists: Top Ten Books for Kids Who Are Reluctant Readers and Top Ten Books for Someone Who Says They Don't Like to Read. I had fun with both of these lists! Any book in the Stephanie Plum series by Janet Evanovich - fast-paced and fun, a perfect starter book for people who like a lot of action and humor. The Glass Castle by Jeannette Walls - for fans of reality TV. Wishin’ and Hopin’ by Wally Lamb - for people who enjoy watching holiday movies; it's also light and short. The Poisonwood Bible by Barbara Kingsolver – one of my favorite books of all time – ‘nuff said. She’s Come Undone by Wally Lamb – I could NOT put this book down. Anything by Stephen King – who is King of can’t-put-it-down suspense – my favorite is The Stand but it’s probably too long for a non-reader to start with: any of his early suspense/horror novels will entice the most reluctant reader. The Story of Beautiful Girl – a wonderful example of how magical a novel can be, for anyone who enjoys feel-good love stories. Room by Emma Donoghue – especially for those who were fascinated by the story of Jaycee Dugard. The Help by Kathryn Stockett – just because it is such an amazing book – who wouldn’t like it? Life on the Refrigerator Door by Alice Kuipers - a novel told in short notes between a mother and daughter - easily digested in a single sitting but emotionally powerful. I could have made a list twice as long! What books would you lend to entice a non-reader? Whew, another rollercoaster week here! The lows? Both of my sons and I were all very sick last week with a flare-up of our chronic illness and spent much of the week lying around the family room uselessly (I really hate being unproductive!). However, on Saturday, the mail delivery included two key items we've been anxiously waiting (hoping) for: our youngest son's acceptance into the local Charter high school he wants to attend and our oldest son's acceptance into University of Delaware (his first college acceptance). All that good news came at once, considerably brightening up the week for us! So, hopefully, this week will be a whole lot better than last. I am still reading book for one of my book groups, The Mambo Kings Play Songs of Love by Oscar Hijuelos, a Pulitzer Prize winning novel about two Cuban brothers who move to NYC in the early 1950's and start an orchestra. I'm almost finished with it. It's a very good book, though a bit long and sometimes rambling. I have enjoyed the story and the writing. I am also still listening to an audio book, The Power of Six by Pitticus Lore, though with everyone home sick all week, I didn't have much time to myself to listen. My husband, Ken, finished In the Garden of Beasts by Erik Larson. He said it was very good, though not quite as riveting as The Devil in the White City (also by Larson). I definitely plan to read this one, too. For a change of pace, Ken is now reading a suspense novel, Another Thing to Fall by Laura Lippman. I think this is one of the books I picked up for him at Borders' going-out-of-business sale last fall. Jamie, 17, finished Monsters of Men by Patrick Ness, Book Three in the Chaos Walking trilogy. It must be an exciting conclusion because I heard him talking to the book, "Oh, no! No! ", then later, "Oh, good." He really enjoyed this exciting sci fi trilogy. Jamie is now reading The Whisper by Emma Clayton, sequel to The Roar which he and I both loved. Jamie has also started a new book for his World Lit class, To Live by Yu Hua, a Chinese novel. He says it's "not bad" so far which is high praise for required reading! Craig, 14, is reading The Hunger Games by Suzanne Collins and enjoying it very much. We will all be ready for the movie adaptation when it is released in March! Last week, I wrote a review of Wonderstruck, an amazing, one-of-a-kind middle-grade book by Brian Selznick. I also posted my list of Top Ten Book Club Picks and a summary of Books Read in January (is it really February already?). And, just for fun, I shared a very cool video for book lovers. I kept thinking, "How on earth did they DO this?" This is one of the strangest winters ever. That tiny dusting of snow in the photo is all that we've seen in January; yesterday and today it was 60 degrees outside! I'm not complaining, but it does seem weird. Great House by Nicole Krauss, a novel by the author of A History of Love. Half Broke Horses by Jeannette Walls, a half-novel, half-memoir about the author's grandmother. Divergent by Veronica Roth, a hot teen dystopian novel. The Novice: A Story of True Love by Thich Nhat Hanh, a Thai folktale that illustrates the tenets of Buddhism, listened to on audio. Wonderstruck by Brian Selznick, a wholly unique and amazing middle-grade novel. I'm still in the midst of an audio book and an adult novel, as well. So, I read 2 grown-up novels, listened to another, and read one teen novel and one middle-grade novel - a nice variety. I enjoyed all of these books - do I have to pick a favorite? Wonderstruck stands out, as it was just so captivating and one-of-a-kind. Half Broke Horses was my grown-up favorite of the month (but even grown-ups will find Wonderstruck compelling). I am already making progress on my 2012 Reading Challenges, with one dystopian novel this month and one for my What's in a Name? challenge. So far, I have visited 3 states and 2 countries in my reading: Arizona, Illinois, Minnesota, Israel, and Thailand. All in all, a good reading month. What were your favorite books read in January?